SingTheWorld is a Google Maps jukebox and photo viewer. 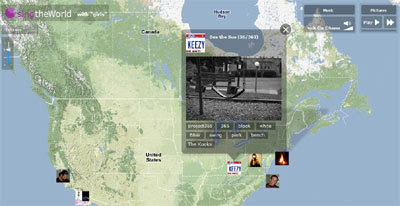 When the map first loads the user is asked to click on a tag. SingTheWorld then plays a song related to the tag and animates through photographs from Flickr with the same tag. Once the animation begins you can, as the map says, "Just relax and let the music free your mind." If the music and the photographs fail to free your mind then you can choose from other tags that appear beneath each Flickr picture.